South Korean stocks tumbled nearly 4.5 percent on Jan.22 as investors were spooked by global selloffs stemming from fears of a U.S. economic recession, analysts said. The local currency fell against the U.S. dollar. 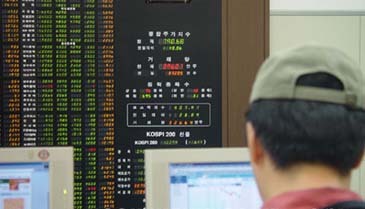 The benchmark Korea Composite Stock Price Index (KOSPI) fell 74.54 points, or 4.43 percent, to 1,609.02, the steepest daily fall since Aug. 16, 2007. Volume was moderate at 312.2 million shares worth 6.82 trillion won (US$7.15 billion), with losers outpacing gainers 764 to 78. Steep losses caused the Korea Exchange, the bourse operator, to activate a sidecar in late trading, suspending trading for five minutes after the main index's futures prices fell more than 5 percent. Heavy selling prompted the key stock index to fall below the 1,600-point mark during the session. "The main index plunged due to panic-driven selloffs. Investors were worried that the U.S. economy may head for a recession," said Park Suk-hyun, an analyst at Eugene Investment & Securities. "The selling spree by foreign investors will continue until U.S. markets rebound." U.S. markets were closed Monday for Martin Luther King Jr. Day, but European stock markets lost ground on U.S. economic concerns. Britain's benchmark FTSE-100 index tumbled 5.48 percent. Asian markets also plummeted with Japan's benchmark Nikkei 225 Stock Average closing down 5.65 percent. Exporters were hit hard on growing concerns that a U.S. economic recession could dampen demand for exports from Asia's third-largest economy. Tech bellwether Samsung Electronics fell 4.96 percent to 536,000 won and top automaker Hyundai Motor lost 0.3 percent to 67,200 won. Financial shares also traded in negative territory. Top lender Kookmin Bank shed 3.09 percent to 62,700 won and No. 2 financial services firm Shinhan Financial Group declined 2.75 percent to 47,750 won. Power equipment making giant Doosan Heavy Industries & Construction lost 10.87 percent to 102,500 won. The local currency finished at 954 won to the dollar, down 5.5 won from Monday's close, as foreign investors cut their holdings in the Seoul bourse, dealers said. Bond prices, which move inversely to yields, rose. The return on the three-year Treasuries dipped 0.05 percentage point to 5.3 percent, and the benchmark yield on five-year government bonds lost 0.02 percentage point to 5.36 percent(Yonhap News).